Tripp Lite's 1.22 m (4-ft.) Blue Category 5e (Cat5e) patch cable has 2 standard RJ45 molded male connectors featuring integral strain relief. The cable is manufactured from PVC 4-pair stranded UTP and is rated for 350MHz/1Gbps communication. Offered in a variety of lengths and colors for all category 5 (Cat5) and 5e cabling needs. Snagless category 5e patch cables are also available (N001-Series). Don’t settle for less than the best—enjoy better signal quality and faster transmission! This four-foot Tripp Lite Cat5e 350MHz Molded Patch Cable ensures peak performance throughout your local area network application. Cat5e cables (also called network cables, patch cables, computer cables, Ethernet cables and LAN cables) are used to connect components like printers, computers, copy machines, routers, servers, modems and switches. The N002-004-BL is manufactured to exacting specifications, using superior materials, for optimal network performance. It’s designed for 1000Base-T (1 Gbps Ethernet), 10/100Base-T (Ethernet), 100 Mbps TPDDI, 155 Mbps ATM, ISDN, voice and Token Ring Type 3 applications. For peace of mind, the N002-004-BL comes backed by a lifetime warranty and has an eco-friendly, RoHS-compliant design. 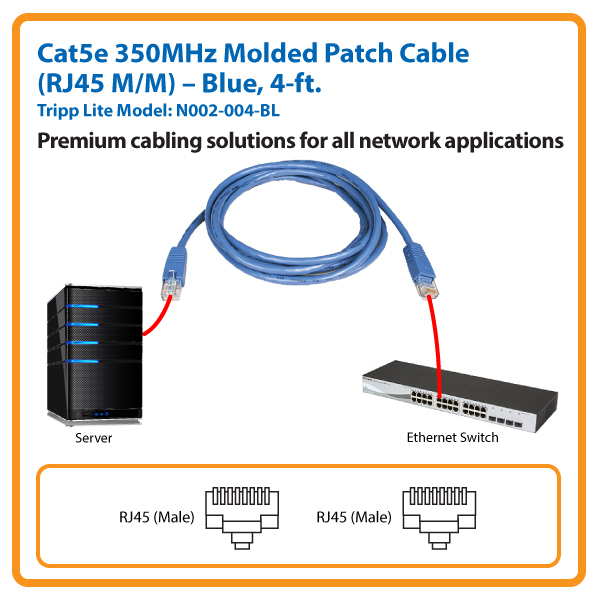 This four-foot Tripp Lite Cat5e 350MHz Molded Patch Cable is the ideal solution for connecting network components like computers, printers, Internet-enabled gaming systems and Blu-ray™ players, copy machines, routers and modems in a home or office application. High-Quality Copper Wire and Gold-Plated Connectors Ensure Error-Free Signal Transfer Manufactured from 4-pair stranded UTP, the N002-004-BL provides high-speed connection and flawless signal delivery. This cable can deliver speeds up to 350MHz/1 Gbps. Featuring a PVC jacket, this four-foot Tripp Lite Cat5e 350MHz Molded Patch Cable is constructed of top-quality materials for long life and durability. Its RJ45 (male) connectors are gold-plated for accurate signal transfer, and its molded integral strain-reliefs provide a secure connection. The N002-004-BL meets the most current industry standards, including IEEE 802.3ab, IEEE 802.5, ANSI/EIA/TIA 568, ISO/IEC 11801 and ETL (category 5e draft 11). For peace of mind, this four-foot Tripp Lite Cat5e 350MHz Molded Patch Cable comes backed by a lifetime warranty. The N002-004-BL is manufactured in compliance with strict RoHS specifications, reflecting Tripp Lite’s commitment to environmental responsibility.